This small copy of the gospels comes from Ireland and is an example of the 'pocket gospels' made there in the early Middle Ages. While their use is not fully known now, markings in them, texts added to them, and the importance of gospelbooks in the lives of saints such as Columba indicate that they had multiple uses in personal devotion as well as in pastoral care. Books of scripture, especially gospels and psalters, were considered to have powers of healing and protection. By the 10th century, this pocket gospels had ended up in southern England, possibly Canterbury, where it was 'updated' with pictures in the latest style and its decorated initial letters scraped off and painted over with ones in a new style. 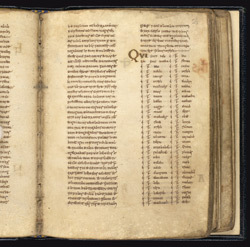 Most of this page remains as it written by the 8th-century Irish scribe. The right column presents the beginning of the genealogy of Christ in Luke 3:23-38. The phrase 'qui fuit...' ('who was [son of] ...') has been written with two characters in a shorthand abbreviation. In the margin, the initial word of the genealogy's first line has been scraped off and rewritten. It is in the script of capital letters sometimes used for gospel books in 10th-century Anglo-Saxon England. This style derives from Carolingian manuscripts, its use in England being part of the church reform and theological renovation which began in the 10th century. Traces of the original letters are barely visible beneath.